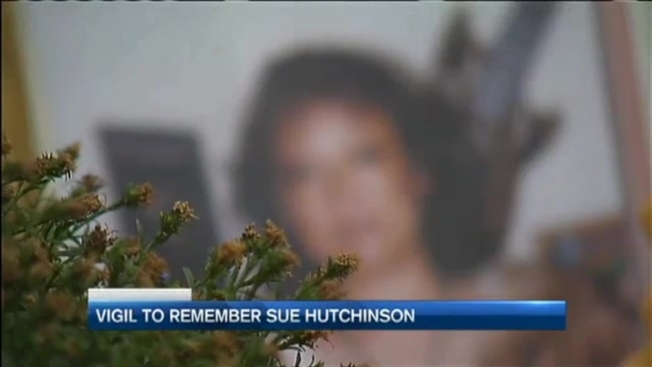 Friends and family are remembering Sue Hutchinson who was found dead in her own Manchester, New Hampshire, apartment Sunday evening as kind, generous, and harmless. About 50 people gathered Tuesday night outside Hutchinson's Calef Road apartment, holding candles and pumpkin lanterns honoring the woman they say would've done anything for anyone. "We needed to do something to light up the place because that's what Sue was," said Haley Gardner, Hutchinson's coworker at the Pine Street Headstart in Manchester. The candlelight memorial was organized by Hutchinson's coworkers. They say she worked in maintenance for Southern New Hampshire Services for at least 10 years. "I am here because she would've been here for me, it's that simple," said Meegan Morton who also worked with Hutchinson. Authorities say the 57-year-old was likely killed about three weeks ago by her daughter's ex-boyfriend Stephen Andrade who was living with her. Police say he stuffed her body into a hidden crawl space in her apartment and later killed himself in a Massachusetts motel. "I said to kick him the hell out of there," said Hutchinson's ex-husband Angel Torres. Torres says he was with Hutchinson for more than 30 years and they were still close friends. He claims he warned her about Andrade, but says Hutchinson had a big heart and Andrade had no other place to go. "She would do anything for everybody, she helped everybody," Torres said. Torres, Hutchinson's three children, and ten grandchildren are now all trying to figure out what went so terribly wrong. "Your guess is as good as mine," Torres said. "A killer is a killer and evil is evil." But Torres says he found comfort in the gathering Tuesday evening- proof of a life well lived. "A lot of people loved her and cared for her," Torres said. An autopsy was performed Tuesday to determine exactly how Hutchinson died and when. Those results have not yet been made public.